Growing Asparagus is a permanent activity, because it's a perennial vegetable crop. It's very important to choose a growing area very carefully as they will spread. Test your soil and ammend with recommended fertilizers and nutrients. Dig an 8 inch-deep ditch down the middle of the bed that is 12 inches wide. Set the individual asparagus crowns 12 inches from each other in the ditch. 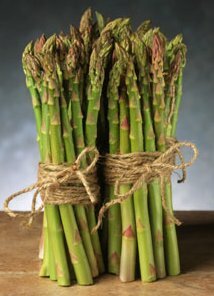 Place 3 inches of soil over the asparagus crowns, water well, and wait 2 weeks or when start to see the plants popping up. Place another 3 inches of soil over the asparagus each week, watering to keep the soil moist. Repeat this until the ditch is filled up about 2 inches above ground level. Do not let the bed dry out for the first 2 years. Each year fertilize with an organic nitrogen fertilizer and mulch with compost. Wait two years before harvesting your spears on newly planted roots (three years with seed). This gives your plants a chance to get established and strong. The young spears are picked in the spring. Diseases: Fusarium Wilt - Protect by buying resistant varieties. 'Mary Washington' - commonly found variety. Bred for rust resistance. 'Jersey Giant' - rust and fusarium wilt resistant and yields early. 'Brock Imperial' - offers high yields. 'Princeville' - does well in warmer climates. 'Purple Passion' - sweet purple variety.